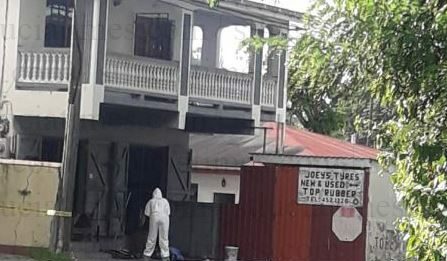 A male individual, identified so far only by his alias ‘Fat Boy’, was gunned down near the Adelaide and Francis Memorial Home, Cedars, Castries Thursday afternoon. Eyewitnesses told St Lucia Times that the incident occurred about 2.00 PM. According to reports, ‘Fat Boy’was in the company of two other males when a vehicle pulled up and its occupants opened fire. It was reported that the two ran and the deceased was hit by multiple gunshots. A person who was on the scene told St Lucia Times that it appeared as though ‘Fat Boy’ was the one targetted in the drive by shooting. Hollywood style; Mr. Minister of justice and national security and the PM. Where do we go from here? They too busy trying to maliciously prosecute police officers who were doing their job. I agree they should do something and do it quickly. If politicans can take credit for a growing economy then they should take responsibility for out of control criminal acts. However if were are going point fingers on who is responsible for the state of uneasy within the police force, especially when it comes to IMPAC then look no further than Kenny D. Anthony. He ran to the Americans giving all kinds of bogus information and then address the nation on national TV stating he saw and is in possession of a hit list put together by the police. All that for narrow political gain. Everytime police trying to do their jobs we always have a problem. MR Zabo as grown folks in society it’s time wake up and behave like adults! Do we need politicians to tell us what is right and wrong, how to raise our kids, how to be proponents of equal rights? lets take the mantle and speak up! stop supporting criminal behavior and change ourselves. Lol why do idiots continually act like those in power can just magically stop all crime? They could clamp down but crime will always be around, it’s as simple as that. Hey Breacher, maybe its because those in power campaigned on we will stop crime. When you’ll stop the political games, we will stop blaming you’ll. STUPID. you know off the cliff anyone who would talk like you,has definitely bought a gun or two off fat boy,no more. Who is that fat boy? Breacher u r so corrrect no Gov can’t dtop crime ….show me a country dat dosen’t have crime and i’ll show u a person without sin.wat we really need is gettin closer wit God through prayers. Y’all and “government should not be blamed” nonsense! When crime is down, they will take credit for it; so, when it’s up shouldn’t they be blamed? Of course they should be! fat boy was notorious in south part of Adelaide as black market gun runner,numbers were always scrubbed,you knew what you were paying cash for. but several bad ar15 crossed hands it was bound to happen sooner or later. Most profound sympathy to the grieving relatives and friends of the deceased. The government, YES, the government is an abysmal failure in putting adequate measures in place to minimize crime. A government’s main priority is the safety and protection of its people from all harm and danger. No one is claiming that government can wave a magic wand and stop all crimes. Only an ignorant person will think that way. However, government MUST shoulder most of the blame for doing very little, if anything meaningful, to reduce crime . Japan has one of the lowest murder rates in the world due to its strict gun laws and its policing strategies. That’s government working for the people. The Minister of National Security should be fired with immediacy and the Chastanet’s administration drag over red hot coals for their spectacular incompetence. I have worked and lived in Japan, you are correct in what you say, but their society is one of respect for others this is instilled in the children from very young, going a long way to making respectable adults and in turn a safer society. It really does start in the home. 100% correct! Everything starts in the home. The home is the most important instituting in any society. If the home is dysfunctional the whole of society becomes dysfunctional. Government though has to take a leadership role in curbing the many incidents of criminal activities. This present administration is tone deaf and apparently impotent or just doesn’t care. The National Security Minister should be sacked forthrightly. He’s completely incompetent. Instead of providing leadership he’s completely demoralizing the entire Police Force. To be brutally honest, the whole administration is clueless. Was it “IMPAC” that killed the 12 citizens? And if it was, was it not a politician hoping to get in who promised to MAKE US SAFE because the one who was there didn’t, couldn’t and so HE WOULD???? we the public encourage it most of all caus we see stuff happen and say nothing keep a lot of criminal friends caused it makes us look cool and fens of the rest hence enabling them and continuing the cycle that makes us accessories and that unbecoming in any proper society. foolish fool has some good ideas but it doesn’t allow any room for a guy like me who enjoys my beer,and just want to know with all these guns out there,half of them went through(fat boy)with all these cops who were paid off by(fat boy),now you don’t know if you can walk from the pub drunk without being shot by a bad gun from(fat boy). Wah …. fatboy eh see Christmas… i mean… you coulda wait for january to die ofcourse… not in the mouth of christmas der….